In Thailand, food is a reason for celebration, and Bangkok Terrace of Salt Lake City has created a menu and space to complement old-world tradition from the Southeast Asian country. Located near the Gallivan Center, Bangkok Terrace offers convenience for lunch-hour outings or dining with friends, family or coworkers. Original recipes from the homeland provide the experience of a cultural escape to what it may be like breaking bread or sharing rice in a Thai home. 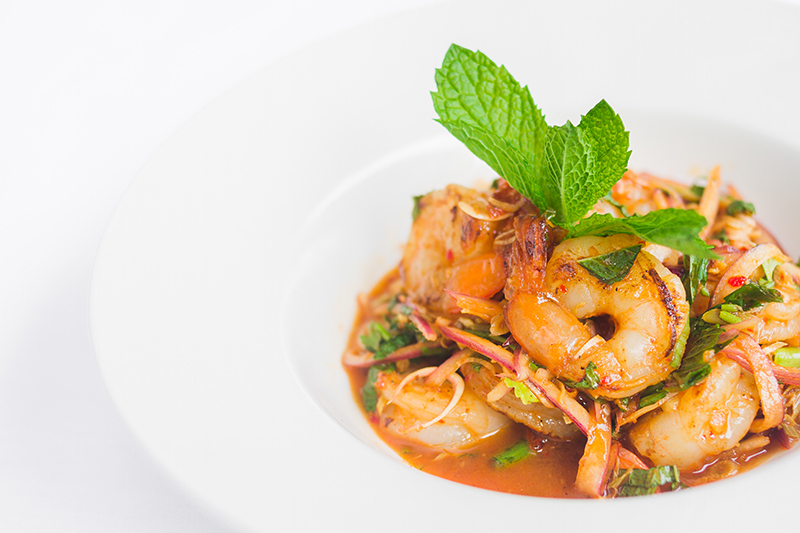 Four main flavorings typically accompany any Thai dish. Salty, sweet, sour and spicy are all fused to provide the palate with a dance of exploration. Putting this theory to the test, we started with the Curry Puff ($9) on the appetizer menu. With a perfected flaky crust, there is no question that this pastry puff is made onsite. Resembling a warm apple pie, the spot-on blend of spice and sweet will leave you begging for more. We also tried a spin on a Shrimp Spring Roll from the Chef’s evening special menu, which perfectly complemented the complex spice of the puff with its delicate shell and addition of fresh veggies in a bit of sweet and salty sauce—a nice and fresh summer appetizer. Open-air windows provide a welcoming dining experience. There is patio seating—however, if you would like to enjoy an adult beverage (alcohol), you will need to sit inside. The space itself is inviting with its purple walls and comfortable, casual setting for conversation and enjoying a Thai craft cocktail. Lychee is the basis for Bangkok Terrace’s Lychee Martini, which explodes in sweetness and offers a beautiful taste blended with the accompanying gin. I recommend ordering a Bangkok-brewed Singha beer ($5) off the menu. There is something special about blending a regional beer with traditional recipes of that region. 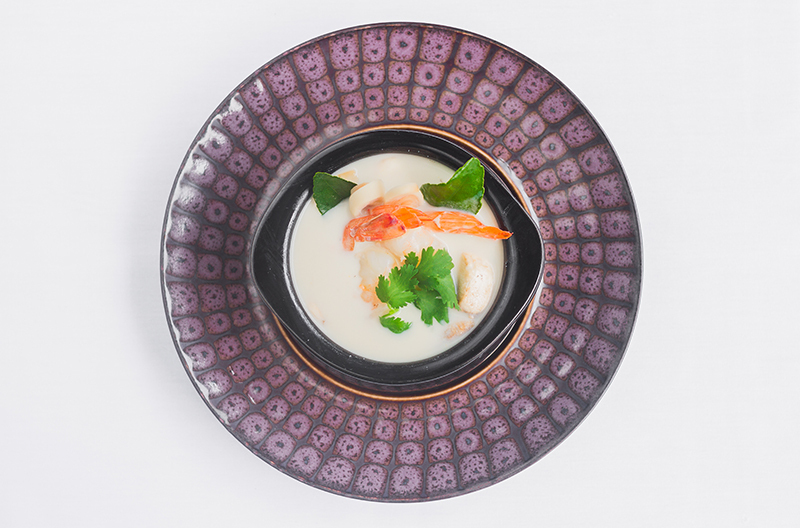 Now let’s talk about what my favorite menu item (so far) is: Thom Kha Shrimp Soup ($7 or $14). It was so delicious, even Goldilocks would agree that this soup is beyond perfection. 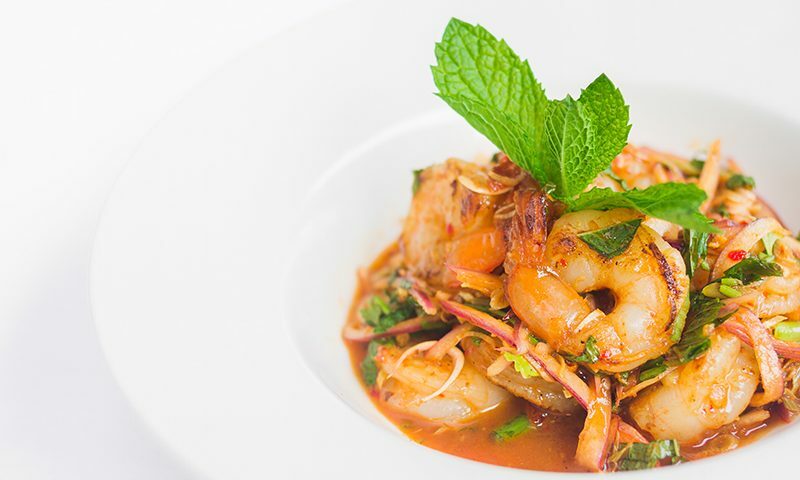 The coconut base with hints of lemongrass pairs nicely with the shrimp, Thai ginger (galangal) and additional ingredients. It is an anytime dish that could never disappoint, unless you are against coconut or shrimp in some fashion. Now onto the mains. Hoi Pad Prik Pao ($16) is a lovely bowl of clams. The dish is salty and is served with rice to compensate. 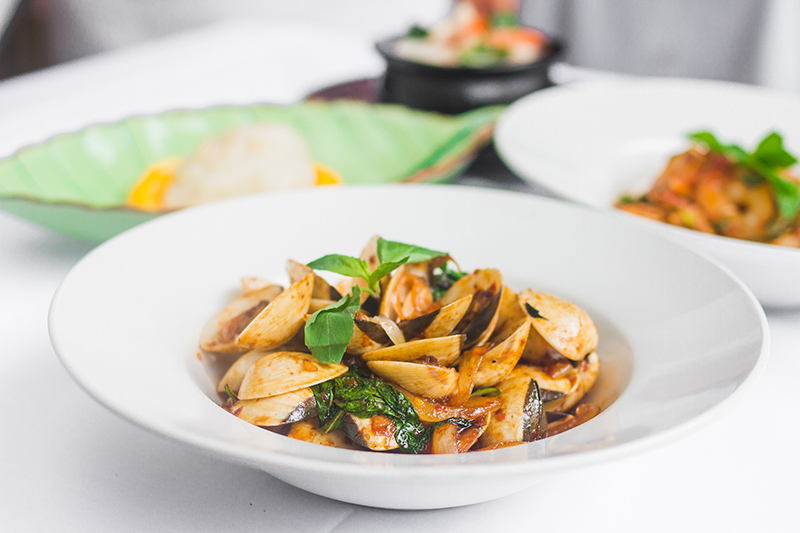 Stir-fried baby clams mixed with garlic, onion and Thai basil in a sweet chili sauce is nice; however, I am eager to try more items from the menu on my next visit. I turned up the spice in the Pla Goong Shrimp Salad ($15) by ordering it with medium heat. Now, while I enjoy some spiciness, I could not finish the dish due to the intensity, and had to order a beer to help quench the heat. The salad consistency is not traditional in the sense of greens and light dressing, and instead offers more protein and thinly sliced lemongrass, mint and shallots. I would recommend it—only next time, I will be ordering it mild. I enjoyed tasting the recipes of Thailand, described at Bangkok Terrace as the sort of dishes they would serve guests or family visiting Thailand homes. Food from this culture is a gift meant not only to be shared and consumed, but also to be presented in a way that creates beauty. Each of the dishes was carefully thought out in terms of presentation and keeping with tradition. Thai food in general offers flavorful Indian spices, yet creates its distinction with the use of local spices and ingredients such as lemongrass, Thai ginger and Thai holy basil. Our service was good for a Friday evening. We were presented with a mango sticky rice for dessert. Photos could never do the flavor justice. Fresh mangos surrounding a wonderful sticky rice is a matchless end to a savory meal.